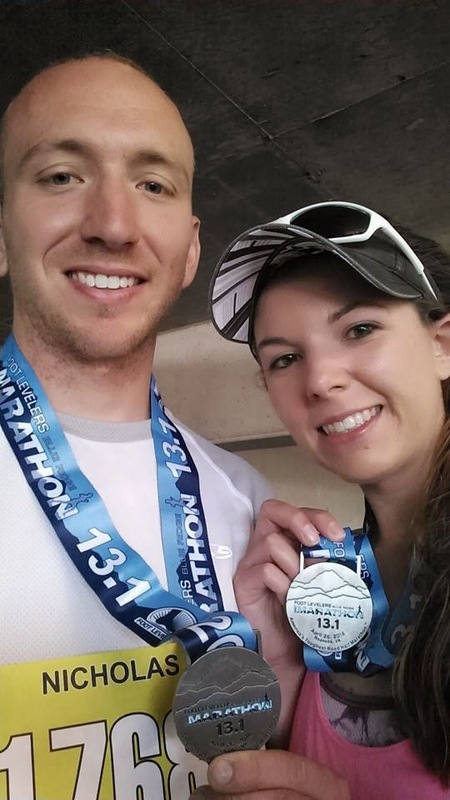 As many of you probably already know, Nick and I ran the Blue Ridge Half Marathon last weekend. 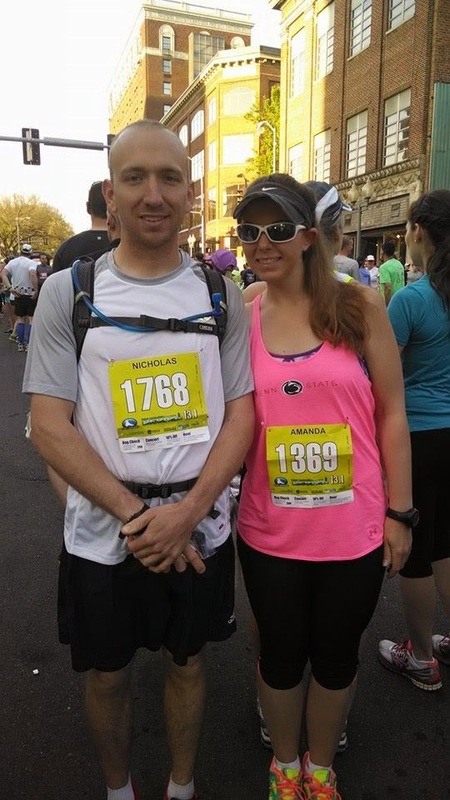 We signed up for this race all the way back in September because we had a 40% off promo code and we thought it would be something different and challenging. 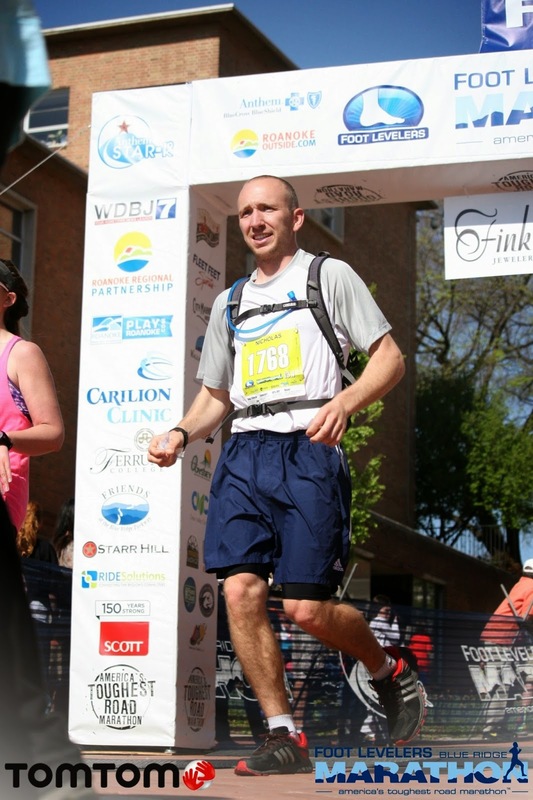 Between signing up for this race and actually running it I ran the Wineglass Half Marathon and the Myrtle Beach Marathon; and to be honest I never really gave this race much thought. I told myself from the beginning that this was going to be tough, that I wasn’t going to set any PRs, and most of all, that I was just going to have fun and enjoy the beautiful location. There was just over two months between running Myrtle Beach and Blue Ridge, and after Myrtle Beach I was having a lot of IT Band issues. 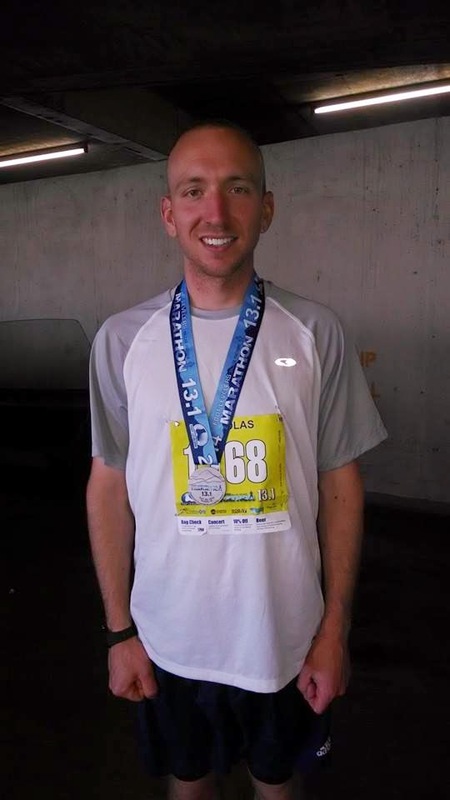 I didn’t do much running for about four weeks after the marathon. I spent a lot of time on the elliptical and bike. Needless to say I started being a little concerned about this race. Eventually I got back into running and found that I didn’t really lose any of the endurance I built up training for the marathon. Nick and I jumped right into running the 7.5 mile loop around St. Mary’s Lake weekly (sometimes more often) and even threw in a double lap two weeks before the race. I was feeling pretty good. Well, as good as you could feel knowing that you were unable to train on anything remotely close to the elevation you’d see come race day. 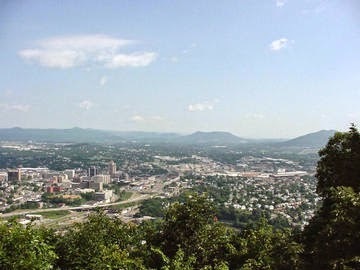 We arrived in Roanoke, VA the day before the race so that we could pick up our race packets. I was super excited that the race shirts actually looked like they were made to fit normal people (my race shirt from Myrtle Beach was the largest women’s size they had and it looks like it’s meant for a middle school girl). I didn’t look too closely to what was on the shirt until later that night in the hotel room. But once I did, I loved it! It’s kind of cocky, but I feel like anyone running this race has a right to feel good about themselves. The race t-shirts were awesome! After picking up our packets we decided to drive the course. I knew the elevation profile was going to be ridiculous, 3,720 ft of elevation change according to the back of the race shirt, but I was not prepared for what we encountered on our drive. So we keep driving, and the road turns into this beautiful winding road heading to the top of Mill Mountain, and I’m telling myself, “this doesn’t look so bad”. Then Nick points out how much the elevation is climbing on the GPS..”We just climbed 100 ft. Oh, there’s another hundred. Yep, there’s more”. And suddenly we’re at the top: 1,746 ft.
We keep driving the course. The race signs are already up so it was pretty easy to navigate our way around the exact course. There’s a lot of hills, but nothing like Mill Mountain until we reach the climb to Peakwood Drive. Words cannot express my feelings as we drove up this second mountain. 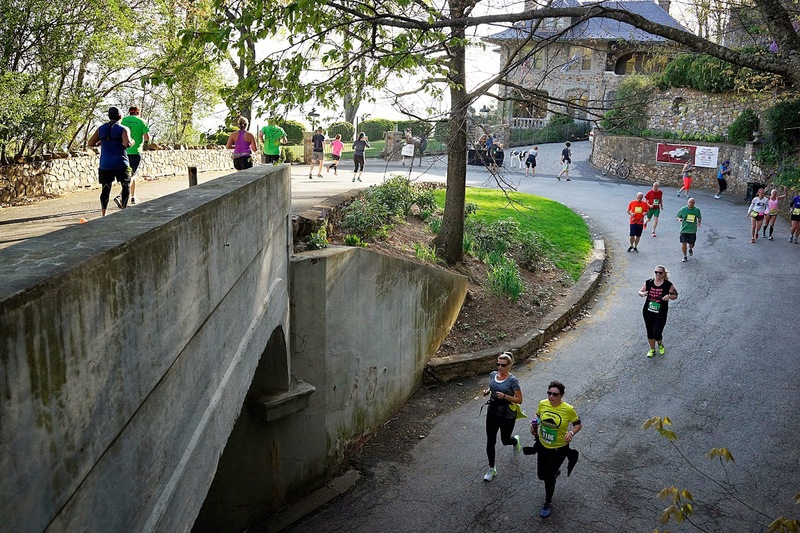 It was “hilly” and they weren’t just any hills; they were steep. After we finished driving the course I decided that my definition of hills would be changing after this experience. No more complainy-pants running on Piney Point Road! We decided to reevaluate our run/walk plan for the next day. 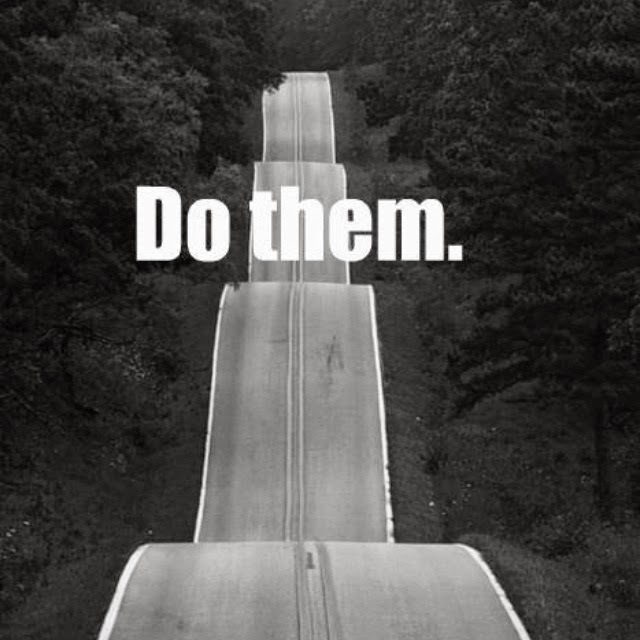 The goal would be 9 min run 2 min walk on the “flat” area and attempt 6 min run 2 min walk on the “hills”. That night I was surprisingly able to get a goods night sleep. Sargey came along with us again so she slept curled up next to me 🙂 I was also surprisingly not real nervous the morning of the race and was able to eat all the food I planned to. This is a huge accomplishment for me, as my anxiety tends to make it tough for the to eat sometimes. We got to the race a little early and we able to walk around and stretch. The race started exactly at 7:30am. Our walk/run plan started out pretty good. We made it to the first climb and started our walk break a little over halfway up the hill. Then we started the climb up Mill Mountain. It was tough, but I stuck to my planned 6 min run 2 min walk for two intervals, then we switched to a 4 min run 2 min walk plan. I have never seen so many people walking in a race before. But if you ask the Blue Ridge Race Directors, they will tell you there’s no shame in walking here! I was so intent on trying to keep my breathing steady and my heart rate in control that I wasn’t paying too much attention to my surroundings. At one point Nick announced that he was pretty sure I just passed about 100 people. How crazy is that? The climb up Mill Mountain was long, but overall I didn’t feel that the grade was incredibly terrible. It felt doable. Maybe that’s just because my legs were still fresh. There was one part that was especially steep, and I was so proud of myself that I didn’t give in and walk early. I kept pushing myself. The top of the mountain is at approximately 3.5 miles, then you get a nice long 2 miles of downhill on the other side of the mountain. This part of the race was so cool. You were on this paved foot path that wound around the mountain. You passed mansion-looking homes. I think I saw some type of zoo. And there was a woman offering Moo-Mosas (not sure exactly what that is, but sounds similar to a mimosa?)! At this point in the race I didn’t realize how big the town got into supporting the runners on their own, so I didn’t realize the Moo-Mosas were for the runners. Anyway, I felt great at this point. My heart rate was completely recovered and my legs didn’t feel tired. The hill was also pretty steep. With all those things in mind I decided that I didn’t want to walk at all on the downhill unless I absolutely needed to. There’s nowhere around Southern Maryland to practice downhill running like this, so I asked Nick to keep an eye on my form to make sure I didn’t hurt myself by trying to “brake” as I was running. Everything looked good, which was probably a product of still feeling fairly fresh. I felt like I was flying down the mountain. Such a cool experience. Once we finally got to the bottom and the terrain was “flat” again we switched back to an 8 min run 2 min walk. Again, this didn’t last long. By mile 6 we were already starting the trek to get to Peakwood Drive, the second mountain for the half marathon. So, we’re running along..it’s hilly, but the 4 min run 2 min walk was still doable..and then suddenly we’re running up a hill that’s so steep, and I’m thinking “oh my gosh, there’s no way I can do this. How am I going to run up this mountain? ?” Well, Nick being the most awesome and best support crew ever would encourage me by saying “Let’s run for three telephone poles.” He’d let me rest, “Ok, now let’s run until we reach (fill in the blank).” He did that the entire way up the mountain 🙂 At one point we were running near two guys who were also struggling like me. Nick was encouraging the “run for so many telephone poles” so we got the guys to run with us for awhile. I always love this part about races. When you get to meet people and encourage each other. 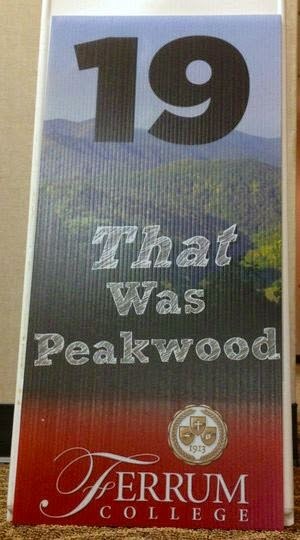 As we’re heading back down the mountain I see a race sign that said “That was Peakwood.” Yep. That sure was Peakwood. I will never forget it. The rest of the race is kind of a blur. My IT Band started hurting again towards the end of the race so I was in some pain. I also remember at one point thinking we were finally at the bottom, just to come to another pretty big climb. As we were getting close to the finish line (roughly mile 12.5-ish) we hear a cop siren. We look behind us, and there’s a cop on a motorcycle driving in the runners lane. We’re thinking “What the heck? What’s going on?” Once he passes us we see a sign on the back of the motorcycle that says “Lead Vehicle”. Oh my gosh, it’s the lead marathoner! He passed us. He was really moving. 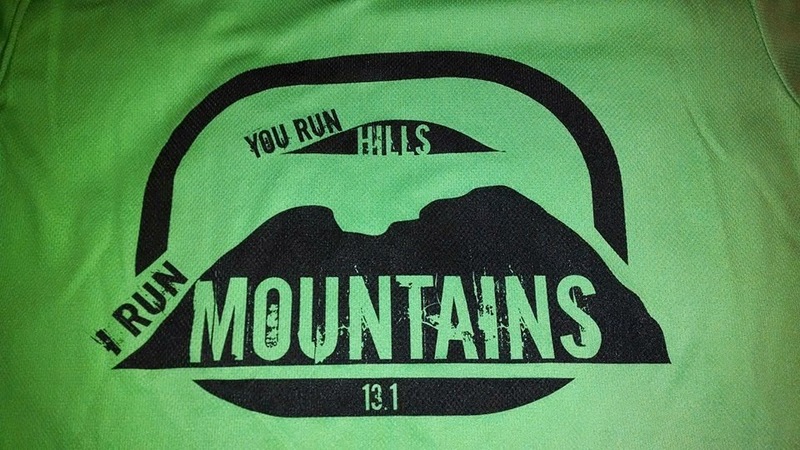 And he had a third mountain to deal with that the half marathoners didn’t. I remember feeling pretty amazed and encouraged. My IT Band was really hurting at this point. I ended up walking a lot during that last mile. As we started getting close to the finish Nick encouraged me to pick it up. I hadn’t really been paying attention to the time. I didn’t have a goal in mind other than “I sure hope I finish in less than 3 hours.” Nick tells me that he thinks we can finish this in under 2 hours 30 minutes. And I was shocked. There’s no way I was moving that fast. When we hit the 13 mile marker I kicked it in, and we crossed the finish line in 2:29:50! Wow. I have no idea how I managed to finish so quickly. Looking at my splits afterwards I was averaging 8:54-ish on the downhill and 13:00-ish on the climb up Peakwood. Overall this was a phenomenal race experience. 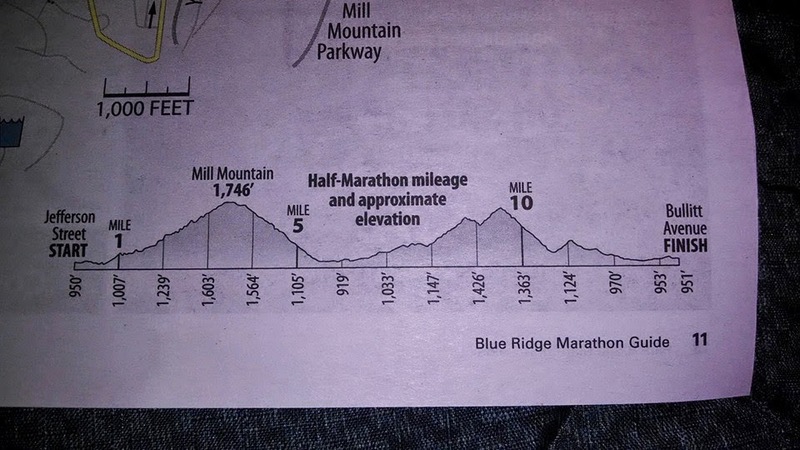 The Blue Ridge Marathon knows how to do things right. The logistics were seamless, the aid stations were stocked, the volunteers were friendly, the post-race food was awesome, the recovery zone (chiropractor, massage and other stuff)was great, the entire town was incredibly hospitable, and the list can just keep going. I absolutely recommend this race to anyone who’s looking to do something slightly different. It’s a tough course, but well worth the effort. 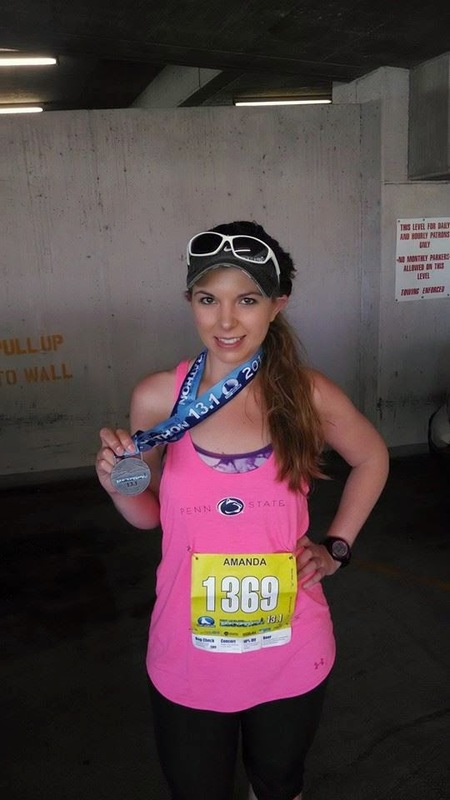 So tell me, what was the most challenging race you’ve done? This one nears the top for me.